TEARS OF MARTYR started back in the late nineties in the Canary Islands (Spain). They recorded a couple of demos. In 2007 they moved to Madrid (Spain) and in 2009 they recorded their studio debut "Entrance". They have recorded in 2012 second full-length album "Tales" produced by Enrik García. 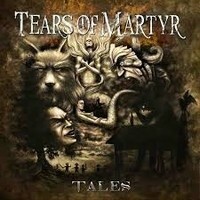 “Tales” via Massacre Records, was recently released. The opener, ”The Scent No. 13”, started its elevation with a calmer atmosphere. Then out of nowhere, emerge fantastic riffs and powerful drums breathing with amazing vocals. Berenice Musa has beautiful voice, singing in soprano right to the edge of Symphonic Metal, a bit reminding of Tarja Turunen of NIGHTWISH. I was impressed by this opener’s perception of melody. “Golem”, featured also as a video clip, is a pure Symphonic Metal oriented offering, partly operatic, magical phenomenon, catchy Gothic chorus with Miguel Angel Marqués’s occsional low end growling. I like the track “Of A Raven Born”, oozed up with amazing symphonic elements, beautiful stronger riffs and an overall magnificent climate, astounding chorus and well played instrumentation. “Lost Boys”, fast paced and vigorous, is totally great, the great mixture of the growl of Miguel Angel Marqués with the vocalic features of Berenice Musa is wonderful, so as on “Fallen Hero”, which sounded a bit gentler. “Vampires Of The Sunset Street” has a remarkable chorus, well done mix of vocal types, fine melodic heaviness. Also worth to listen are: ”Wolves And A Witch” with sturdier riffs, Celtic like harmonies and other elements of Folk Metal, acoustic “Ancient Pine Awaits” with duo singing and “Mermaid And Loneliness” pictured as a great interesting balladry. TEARS OF MARTYR surprised me with its attention to details and classiness, it harbored wonderful music and catchy melodies melody, well written Symphonic Metal. Surely fans of NIGHTWISH will be in locking onto this one for grabs. This album is a source of both relaxation and anxiety, don’t get too comfortable.